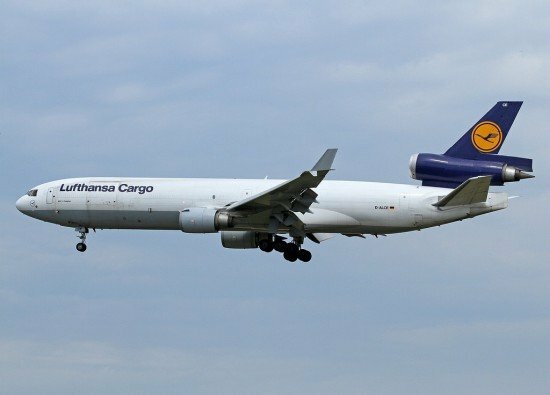 The German Federal Bureau of Aircraft Accident Investigation (BFU) released a preliminary report of the investigation into a tailstrike accident during a go around involving an MD-11 cargo plane in Brazil. The Lufthansa Cargo McDonnell Douglas MD-11F cargo plane, registration D-ALCE was damaged in a landing accident at São Paulo/Campinas-Viracopos International Airport, SP (VCP), Brazil on November 24, 2013. The airplane operated flight LH-8258 from Frankfurt, Germany to Curitiba, Brazil, with en route stops at Dakar, Senegal and Viracopos Airport. The accident occurred on the leg from Dakar to Viracopos. The en route and descent phases were uneventful. The flight was cleared for an ILS approach to Viracopos’ runway 15. As the plane was established on the ILS , the crew configured the airplane for landing. After contacting Campinas Tower, the flight received clearance to land with the wind at 140 degrees, 14 knots. At 08:07, shortly after selecting flaps at 35 degrees, the pilot in command switched off the autopilot. Flaps were set at 50 degrees and the crew then worked the landing checklist. The approach was continued and the airplane touched down at 08:08 at a speed of 152 kts Calibrated Airspeed (CAS) and a 7° pitch angle. Three seconds later both pilots called for a go around because they felt the airplane had bounced. The pitch angle decreased to 6° and then increased to 12°. At that moment, the thrust revers of all three engines deployed. Flight deck indications showed they were deployed for about one second before they were commanded to be stowed again. The pilot in command ordered the flaps to be raised to 28° and stated to the copilot that the engine power was not increasing. By then the pitch angle had dropped to 3°. Eleven seconds later the pilot in command ordered stabilizer trim. At that time the speed began to rise again from the lowest recorded value of 118 knots. The pitch angle increased again to 12° and then further to 15°. The airplane became airborne again at a speed of 144 knots, 28 seconds after touching down. The stall warning then sounded during four seconds. The airplane climbed away and was positioned for landing. A safe landing was carried out at 08:30. After landing it appeared that the MD-11 had suffered a tail strike. The pilot in command reported that the power levers were stuck as he attempted to advance them for a go around. Using a ‘massive’ force he was able to advance the throttles.